You’ve seen them. They’re small presents tacked onto bigger ones. Stocking stuffers. You show them to the kids and share them on social media. They can be almost anything, these gifts, but what they have in common is that they probably came from Archie McPhee. A massive online retailer with a brick-and-mortar location in Seattle, McPhee’s is the internet’s foremost destination for novelty, kitsch, and weirdness. It sells a little bit of everything, but we were intrigued by one product line in particular. That’s Mr. Bacon, the face of McPhee’s vast catalog of bacon-inspired products. Take a look yourself and you’ll find bacon magnets, bacon board games, and just about any consumable you could imagine taking on that rich, smoky flavor (bacon toothpaste, anyone?). One of the minds behind McPhee’s madness is David Wahl, who, over 22 years, worked his way up from packing boxes to becoming the company’s “Director Of Awesome.” We asked him what it takes to become the internet’s biggest and best purveyor of bacon novelty swag. The A.V. Club: How did Archie McPhee get started? David Wahl: Archie McPhee is the brainchild of Mark Pahlow. He basically started in Los Angeles buying various objects and reselling them to new vendors. He was the person who started selling acupuncture models to head shops, for example. Over time, he started importing strange things and reselling old things, and a lot of that stuff dried up in the early ’90s, the weird stuff, so that’s when he decided to start making weird stuff. AVC: How did you get involved? DW: I actually used to get the catalog back in the ’80s and said I was going to work there someday. My wife got a job in Seattle, and her job paid for us to move out here. I answered an ad that said “weird catalog company looking for people” and packed boxes [at Archie McPhee’s] for years. Now, I am the director of awesome, and I’ve worked here for over 22 years. AVC: What does a director of awesome do, exactly? DW: I manage the creative team, I manage the IT department, I do the marketing. We’re a small company, so I do whatever needs to get done. AVC: When did you start making bacon products? What were some of your earliest ones? DW: The earliest bacon product we made was in 2003—the bacon air freshener. At the time, there were a few oddly scented air fresheners but nothing too weird. There were a lot of those scratch-and-sniff-type stickers that had really odd scents on them, so we got a scent of bacon and put it on an air freshener that looked like a big slab of bacon. We just thought it was funny, but we were shocked at how well it sold. It just catapulted itself to the top of our sales list right away. Then we followed it up with bacon bandages, which was kind of a natural because of the shape of a bandage looks like a little strip of bacon. We have sold enough bacon bandages to stretch from Seattle to Portland a few times. Then we did bacon dental floss, bacon lip balm, bacon toothpaste. All that kind of stuff was where it all started. AVC: There’s some wild stuff on here. How are these ideas and designs constructed? What does your process look like? DW: Obviously, at this point we’ve done so many [products] that we are only interested if it’s either really easy and good or if it’s some new area that we haven’t done before. For instance, we have a product that’s a big hit called a yodeling pickle, so we duplicated it and made yodeling bacon. We really love to do stuff that we don’t think other people would do. But we also did enough stuff that so many people copied us. Like, we were the first people to do bacon tape, and all of the tape companies copied us after that. It’s hard because some of the stuff—now it just seems kind of passé because everybody’s doing it. AVC: How do you protect yourself from imitators? DW: We copyright our stuff, but you can’t really copyright something being bacon-flavored or the shape and look of bacon. As long as no one copies the exact product there’s not a whole lot we can do. But we did copyright—we have a figure named Mr. Bacon we put on all of our products and there’s a Mr. Bacon bendy figure, so that’s one of our ways of doing it. AVC: What are your biggest sellers in the bacon category? DW: It’s changed over the years, but when bacon first started becoming popular it was seen as kind of a rebel food, because so many people were turning toward low-fat, healthy diets. So bacon started to be seen as a pariah because it’s very fatty and salty. Then people like Anthony Bourdain and other people started saying, “Well, no, I like bacon and I like pork,” so people started to self-identify with it as a way to take a stand against overly conscious healthful eating. Bacon bandages were insane. Bacon candy canes, they come back around and are popular, like, once every few years. The all-time bestseller is probably our Uncle Oinker’s bacon mints. AVC: Are there any designs or products you thought would do better than they actually did? DW: Oh, yeah. What I thought was really cool was the bacon belt. It looks like a strip of bacon, and we thought, “This is gonna be a big hit,” but we sold barely any at all. And we did a bacon-scented mustache. That one didn’t sell that well. But most of the time—and that’s why we keep doing ’em—the bacon stuff actually does sell. Some of it doesn’t sell forever, but it does sell. AVC: What can you tell us about the consumer? Who would you say is your demographic for these products? DW: It depends on the product, but a lot of times we find that they’re gifts for people because people get identified with bacon in their family. 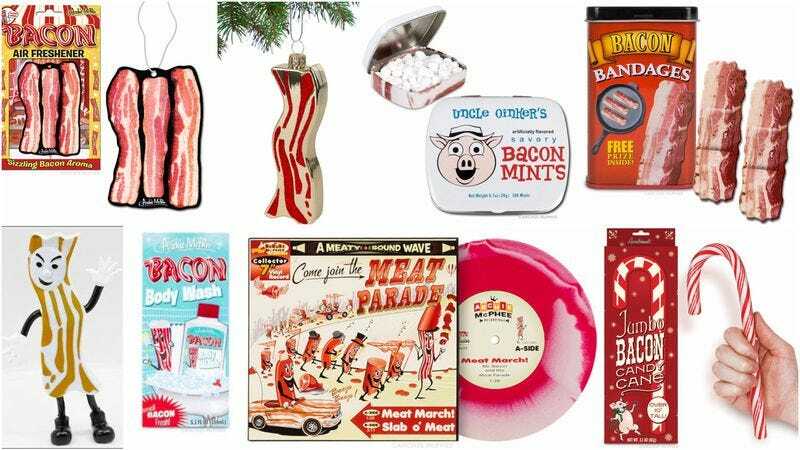 The bacon air freshener is perfect for Dad’s car or, you know, “Uncle Jeremy will get a kick out of the bacon toothpaste.” A lot of times, too, especially the candy and stuff, a lot of times offices or groups buy them. It’s kind of a fun community activity to taste them all together. Much like what you guys did! AVC: Is there a particular time of year that sales spike? DW: Christmas is the big time. A lot of this stuff is gifts for other people. Bacon is such a good, strong personality identifier for some people that it’s a great addition to Christmas. We always say it’s fun to put some savory candy canes in your tree. AVC: In terms of food-related products, is bacon your biggest seller? Is anything nipping at its heels? DW: Nothing touches bacon in terms of sale. Bacon is definitely the most popular flavor of anything we’ve ever done. The pickle would be the follow-up flavor, and we’ve experimented with other stuff with varying degrees of seriousness. We do gravy candy canes. We did vegetable candy that tastes like corn and green beans. We do lots of stuff. We’ve also experimented with wasabi. We did a wasabi toothpaste that did pretty well. AVC: What other categories are big sellers for you? DW: The things we usually do best on are things nobody else would do. One of our biggest sellers right now are finger hands, which are the tiny hand finger puppets that go on the tip of your fingers. That’s been huge for us over the last few years. And we spun that off into finger feet and duck feet for your fingers. Another big thing this year is a cat bonnet. We did an inflatable unicorn horn for cats that sold really well. And we did an inflatable wizard hat, but this year we wanted to go with the plain and simple cat bonnet, which has done great for us. The perennial Christmas bestseller is handerpants, which are underpants for your hand. AVC: At the end of the day, bacon has made your company a lot of bacon. DW: Bacon has been good for us. We love bacon. It’s funny—bacon is one of those things that we were kind of over before everyone else. But I have to say that I’m amazed at the staying power of bacon. This is a category that’s lasted from 2003 until today.